Great movies—and even good ones, really—require a little reflection. Most of them can’t be completely unpacked in one viewing, or at the very least, without some constructive mulling. But in this “firsties” age, when snap judgments are issued at 4G speed and Twitter creates instant critical consensus, time for a critic to consider (or reconsider) a new film’s worth has become something of a luxury. It’s not a total lost cause: Most movies screen for the press with enough lead time to form a cogent, thoughtful analysis. But timeliness is a factor in entertainment journalism, and especially at a major film festival like Cannes, where attendees can provide something close to a “scoop” on high-profile new movies. Nobody wants to be late to the party. Everyone wants to “shape the dialogue.” And often that means forcing a response—some kind of opinion, no matter how premature—before the house lights have even come up. This is no high-horse tirade. As anyone who’s been following my Twitter feed this week (plug, plug) can attest, I’ve been plenty quick on the draw myself. Did I go too easy on Captives, which my gut told me was seductive enough to overcome its narrative stupidity, but which seems much more misguided in hindsight? Was I too hard on Maps To The Stars, whose comedy is painfully shrill, but which may have hidden reservoirs of meaning and value? At least with those titles, I was able to muster some degree of confidence in my take, even if I end up amending, reversing, or denouncing it entirely in the future. One can add Goodbye To Language to the list, too. I’ve really buried the lede here: Godard shot this 70-minute feature in 3-D, and he exploits the format in radical, intriguing, and even funny ways. Sometimes that means deliberately breaking the rules of stereoscopic filming to disorient the viewer, as when he isolates the images being fed into each eye, creating two opposites fields of activity. Other times, he uses the technology to crack jokes, superimposing one line of on-screen text over another. And there are some moments in which he seems to embrace the conventionally splendiferous possibilities of 3-D, mimicking the experience of a late-night drive (the dashboard looms a majestic blue in the foreground) or looking out a window onto the glory of nature. Visually, it’s a compelling experiment, even when the content is a typically dense clutter of ideas. What’s it about? Probably just about everything that’s ever been on the filmmaker’s mind, from the bastardization of culture to the evolution of how we process images to the disconnect between men and women. There is a hint of a story, a fragmented cousin to Contempt—two lovers hashing out their issues between more abstract passages. “I hate characters,” the woman says at one moment, which could be an artist’s statement, given the way Godard often reduces the people on-screen to mouthpieces for his cranky ruminations. Rhetorical questions (“Is society willing to accept murder as a means of reducing unemployment?”) abound. Hitler makes an appearance. So do smartphones, an evil for our current age. Claude Monet gets quoted. Jacques Ellul gets hailed as a prophet. The film is stubbornly, unapologetically avant-garde, making the other Palme contenders—even something heady like Winter’s Sleep—look ultra conventional by comparison. Yet Goodbye To Language is nowhere near as alienating as Film Socialisme, in no small part because it’s about three times shorter. There’s a looser, shaggier quality to the movie, which often interrupts its characteristic flood of assertions for stretches of ramshackle wandering. (As many critics have already noted, with some degree of delight, there are fart and poop jokes in this movie.) References to Frankenstein are chased by an unlikely, period-piece interlude starring Mary Shelley. She writes slowly on a scrap of parchment, Godard studying the process closely. “This is how people used to write and communicate,” he seems to be saying. “And look at the masterpieces they produced.” Is Goodbye To Language really about how the ease of communicating—how every thought can now be instantly, painlessly fired into the ether—has led to the demise of language? If so, that adds a layer of irony to the real-time, social-media, insta-responses the movie’s premiere provoked. Some are speculating that Goodbye To Language could be Godard’s eulogy not just for language, but also for cinema itself. There’s certainly a sense of finality, as though the filmmaker were announcing that either the art form is dead or that it’s evolving into something entirely new. I’d be lying if I said I knew what exactly the director was saying here. Comically resistant to conclusive readings, his work supports endless interpretation. But what will stick with me this time are the scenes of canine life peppered throughout. Like Stan Brakhage’s seminal experimental epic Dog Star Man, Goodbye To Language is a tempest of information, anchored by the simple saga of a mutt and his master(s). 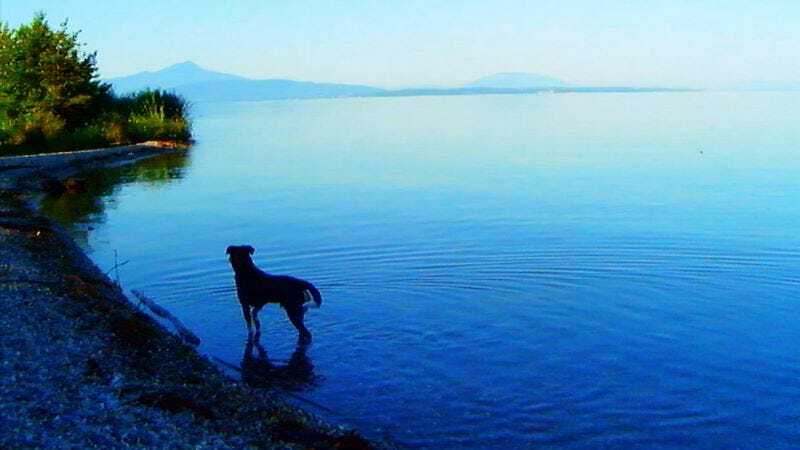 Appearances by that intrepid animal, rendered multidimensional through context as well as 3-D, remind viewers that Godard is not just the genius maker of daunting, digital manifestos. He’s also, apparently, a dog lover. How strangely humanizing. For entirely different reasons, I resisted passing immediate judgment on Xavier Dolan’s new film, too. In this case, the delayed response had more to do with wanting to build a mental case for an artist I admire—an act that would require ignoring everything just slightly off about this latest melodrama from the prodigiously talented, 25-year-old Québécois filmmaker. Even by Dolan’s standards, Mommy (Grade: C+) is self-indulgent. Worse, it represents the first case in which his seductive style—pop-music cues, scenes of ferociously heated verbal conflict, operatic slow-motion, etc.—seems at odds with his material. I Killed My Mother, Dolan’s debut, pivoted around a very different but similarly complicated mother-son relationship. (The auteur, it seems safe to assume, may have some issues there.) Yet despite some stray hints of pathological complexity, among them the impression that the two characters may have an unhealthily symbiotic bond, the relationship between Diane and Steve can’t sustain this much-longer movie. Furthermore, Dolan doesn’t do much with Kyla (Suzanne Clément), the stuttering, impossibly patient neighbor who begins palling around with the two; the character seems to exist mainly as a way to wedge Clément, one of the stars of Dolan’s underrated Laurence Anyways, into the movie. Overextended at 140 minutes, Mommy features lots of shrill shouting matches and flights of extravagance—for example, a glorious nod to a sequence from Spike Lee’s 25th Hour. Mostly, however, these elements just distract from the failures of storytelling, and how Dolan seems to be delaying the inevitable conclusion. Also, Pilon is seriously, counterproductively irritating in his role. Or maybe it’s just the role itself, which requires the actor to be constantly yelling, cursing, threatening, cackling, insulting, or pouting. He’s less enfant terrible than just roundly, generally terrible. As much as I prefer having some extra time to make up my mind about a movie, I’ll admit that some films pretty much reveal all their secrets and insights at first glance. Jimmy’s Hall (Grade: B-), the latest from legendary English director Ken Loach, is one of those films. Barry Ward stars as Jimmy Gralton, a Communist leader who opened a community hall in 1920s small-town Ireland—a place where the locals could take adult-education classes during the day and dance their troubles away at night. This didn’t sit well with the local Catholic leadership, however, and Gralton was eventually deported for his troubles. The film finds him returning to the community after a decade or so in the United States, ready to take another swing at modernizing the area. Though its setting and vision of civil unrest make it something of a companion piece to Loach’s The Wind That Shakes The Barley, which won the Palme a few years ago, Jimmy’s Hall is actually closer in spirit to Footloose. Jimmy’s old rival, Father Sheridan (Jim Norton), is presented as a crotchety killjoy, determined to squash the spirit of these unruly rebels, who are in truth very, very wholesome. Loach, working in his usual handsome but never snazzy style, wrings some tender pathos from his hero’s reunion with his old flame. But he also stacks the deck so entirely in Jimmy’s favor that the film never rises above the level of a mildly stirring protest song. It’s fluff—and I don’t need another few days to feel confident saying so.